James Pope (Kyle Mooney) lives in a very dangerous world. So dangerous, in fact, that, he has spent virtually all of his 25 years in an underground bunker he shares with his parents (Mark Hamill and Jane Adams), avoiding the toxic pollution that has made the outside world uninhabitable. James is no Boo Radley however, and displays no obvious physical or mental peculiarities despite his extremely limited environment and range of experiences. Emotionally, he’s pretty much a happy child in an adult’s body, sometimes petulant but never really bad. This state of mind has been cultivated by his sole source of entertainment, a television program called Brigsby Bear Adventures. It’s a cheaply produced children’s program that packages odd life lessons (“curiosity is an unnatural emotion!”) within a sickly-sweet format featuring an anthropomorphized bear and two bizarre female characters. Next to Brigsby Bear, Barney & Friends looks like a work of art, but James doesn’t care because Brigsby is all he knows. Then one day the FBI comes calling, and James’ world is upended. It turns out that the air outside is perfectly breathable, his “parents” kidnapped him as an infant, and the television program he watches obsessively (a new videocassette has been arriving weekly at the bunker for years) were created by his “parents” for him and him alone. Now James has to adjust to the normal world. He’s re-introduced to his birth family, and tries to mix with a teenage crowd whose members are surprisingly tolerant of his immaturity and lack of specific knowledge about what’s new and cool (quite different from most teenagers I’ve every met, but never mind—this entire movie is set on Wish Fulfillment Island). 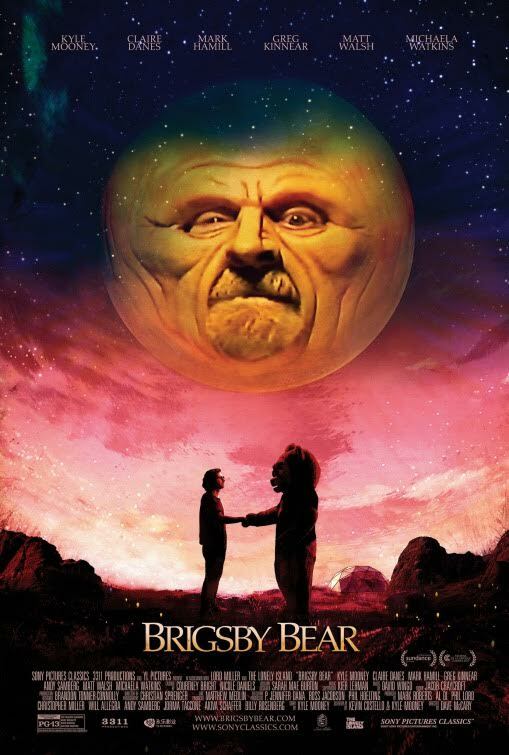 James also decides that the best way to make his life whole is to create a new Brigsby Bear episode, with the assistance of his friends and family (including a cop, played by Greg Kinnear, who has always wanted to be an actor, because of course it does). James’ process of becoming “normal” is portrayed with all the depth of a series of Saturday Night Live sketches, and I can see how the concept might have been successful if delivered in a series of 3-minute doses. The TV sketch format also would excuse the stereotyping and lack of development of the secondary characters, including a saintly black dude who selflessly helps ease James’ transition to the normal world, and several lovely young ladies who adore him for no discernible reason. It’s odd that a film featuring several SNL veterans (including Andy Samberg, Beck Bennett, Michaela Watkins, and director Dave McCary as well as Mooney) can manage to be so consistently unfunny, but then a lot of SNL sketches aren’t funny either—although, mercifully, they are much shorter than this film. On the plus side, Mooney has a talent for playing the bewildered innocent, and in this film he takes the concept of the boy who never grew up to a new extreme. Like an infant, James expects to be constantly adored by all who behold him, and that’s pretty much what his film demands of its audience as well—to be chucked under its chin and told it’s beautiful, just because it exists. Oh my dear; you seem to have missed that this is a fairytale. It certainly isn’t an examination of the themes of abduction or stockholm syndrome. Sheesh. It’s a story about embracing what narrative and imagination can combine to give you…especially when you are growing up. Sorry to see that you missed it. I couldn’t agree more with this review and am bewildered at the critics general approval of it. You can bet families of people with emotional traumas or obsessive mental issues would not approve of the overdone, not so simple “encourage the delusion” approach Brigsby Bear unsubtly preaches. And I’m certainly no partier, but I’ve been to enough of them to know even the most open minded stoners would duck out of a conversation about a show for 3 year olds.